Tonight: Mostly cloudy. Muggy. Coastal fog. Lows around 70. Saturday: Mild and Humid. Sunny breaks. Strong to severe thunderstorms between noon and 8 PM. Highs around 80. Sunday: Sunny. Beautiful. Less humidity. Highs around 80. After a nice day for most of New England, with a few spotty storms, we now wait for more widespread storminess on Saturday. 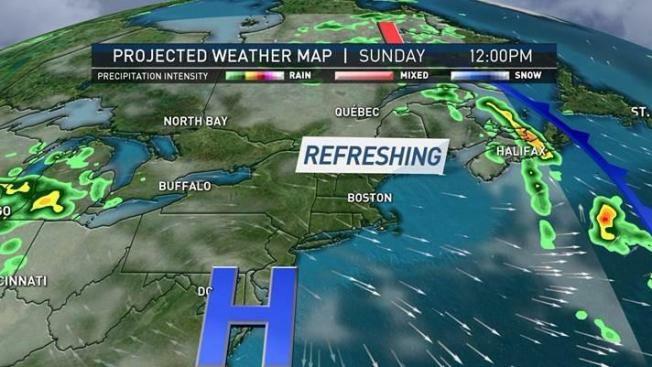 A cold front and its parent low pressure system approach New England overnight. Expecting a mostly dry night ahead as showers and thunderstorms run into stable air mass in place across southern New England. Fog and low clouds return as moisture and cooling temperatures return. Lows dip into the mid to upper 60s. Cold front traverses across the region on Saturday, bringing enhanced chance of showers and thunderstorms with it. Some thunderstorms may contain small hail, gusty winds and torrential downpours. Highs reach into the upper 70s to 80 degrees south and mid 70s across the north. These storms will spread from west to east through our Saturday, with the stronger thunderstorms developing by the afternoon. By dinner time, the leading edge of these storms will stretch from interior Maine, to southern New Hampshire and into the Boston-area. These storms quickly come to an end as the cold front passes offshore by Sunday. Expecting a big turnaround on Sunday with sunny skies, drier and less humid as high pressure moves in behind the cold frontal passage. High temperatures range from the mid 70s to near 80 degrees across the south and mid 60s to 70 degrees across the North Country. Sunday is definitely the pick of the weekend weather-wise. Looking ahead to the start of the work week, an area of low pressure will emerge out of the Great Lakes region, making its approach towards New England as it rides along a stationary front draped across the mid-Atlantic. Expecting mostly cloudy skies on Monday with highs reaching into the upper 70s south and upper 60s north. A few rounds of showers make their way across the region, focused mostly during the second half of Monday. Showers and clouds linger into Tuesday before the system skirts offshore by the afternoon with temperatures reaching into the upper 70s. High pressure moves in behind the departing low pressure system by Wednesday and appears to stick around through Friday, resulting in a drier-than-normal period. Temperatures will crest into the upper 70s to near 80 degrees during this time, which is slightly below or at the climatological norm for early August. More details are on your exclusive Early Warning Weather 10-Day Forecast on NBC Boston and necn.